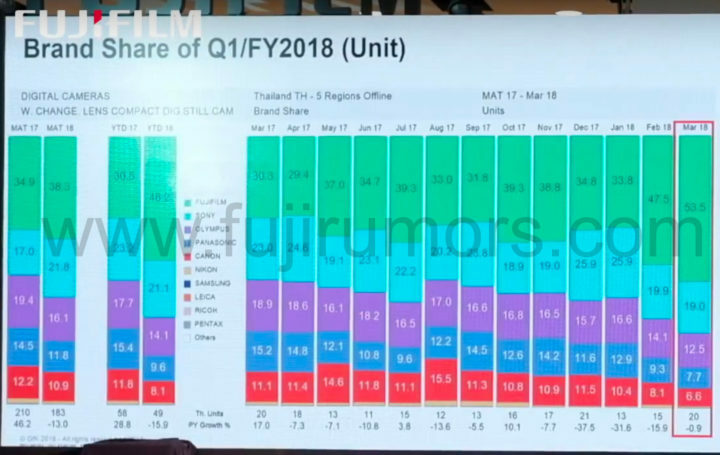 There is one country, where like no other, Fujifilm mirrorless cameras are selling like hot cakes and dominate all other brands: Narnia Thailand! It might seem a phantasy tale, but it’s true. 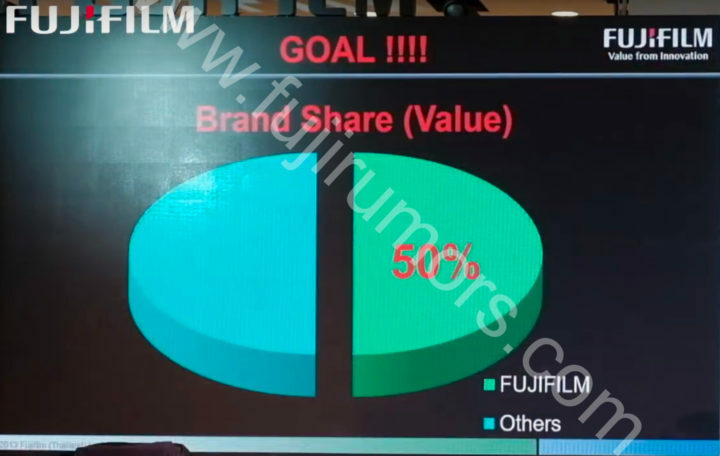 Today I can share with you the precise numbers of the growth (see below), as well as Fujifilm Thailand’s new goal: 50% market share of the entire compact (they probably mean mirrorless*) interchangeable lens camera market (see above)! 50% market share of the entire mirrorless market might sound foolish, but if you look at the detailed data down below, you will see that they are already not too far away from that goal. We know that in Thailand the X-A line (and very likely also the X-T100 line) sell incredibly well, 2 lines that in Europe and USA don’t have much appeal (maybe the Fujifilm X-T100 could find some bigger fellowship over here… it certainly deserves one). * Fuji Guys Billy said in February 2017, that “Fujifilm is Nr.1 brand in Thailand“. He does not specify if DSLR is included, but it seems from the video he is including DSLR cameras, too. 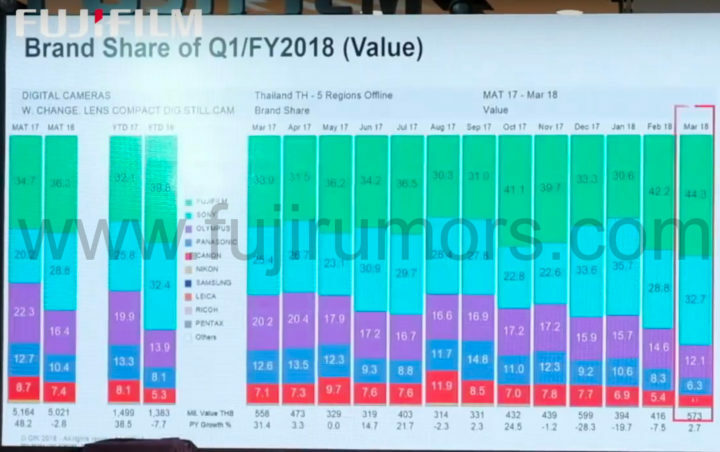 Globally Fujifilm continues to register growing profits in their imaging division (which includes also Instax cameras – the core of this growth), but the overall ILC market share is not even remotely close to the one in Thailand. However, also the X and GFX series seem to enjoy a constant growth, which is also the reason why recently Fujifilm announced they will boost lens production capacity by 70%. We register huge differences in terms of sales, depending on the country. For example, in Japan Canon wins the mirrorless battle, dethroning Olympus from the first spot (report at mirrorlessrumors). In some EU countries (like Germany), Sony has surpassed Nikon, whereas in USA Canon and Nikon DSLRs are still selling better than any mirrorless camera, but the trend is gravitating towards mirrorless also there. We have written about the “final digital camera war” several times here on FujiRumors. I also asked you what should Fujifilm do to survive this “war”. Also, back in 2016, we discussed Sony’s fast & furious hardware updates Vs. Fuji’s Kaizen philosophy, and we wondered, which one is the better strategy to win the mirrorless battle (includes a Poll). The discussion has been recently fueled again by Kevin Raber, who talks about Nikon’s jump into mirrorless and the upcoming “mirrorless war” (via SonyAlphaRumors). Guys, I have no idea how all this is going to end, who will win and who will lose, if Fujifilm will remain a niche product for the coolest amongst all photographers ;-), or if they will grow stronger also outside of Thailand. 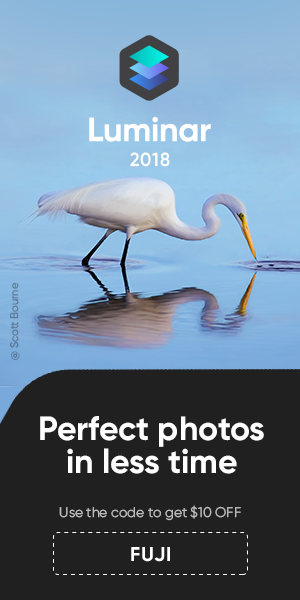 I only know one thing… my next holiday, I better plan it in Thailand to finally meet all those fantastic X-shooters there. Any meet-up in Bangkok this winter?